Open Innovations Lab is a platform for Budding student innovators to explore their technology passion. The motivational thought which actually inspires me to celebrate small wins. Starting a company is hard, growing one and running it is hard, sometimes I feel like I’m not winning or getting anywhere. Many people celebrate the big wins (when the needle really moves), but what about the small wins? Recognizing small victories can boost your morale and provide a surge of energy. They may alleviate the stress that can drag you down. Fun times help you recognize successes even if they aren’t earth-shattering. They provide you with the motivation to keep going. For a long time, I thought I had to develop something that had never been done before to be successful. While that is somewhat true, but mostly an innovation can be quite simple. Just fulfill a basic need. Innovation will come from simple ideas with a twist. The organization, including fortune 500 companies collaborated with us to accelerate innovation in their internal and external channels. PWC, Unilever, Kimberly-Clark, Microsoft, Infosys, American Airlines and many more are on board because there is so much we can draw out from collective wisdom (They have a million ways to help you nail down what you want to achieve). Brief about our OI Lab startup? An open platform that brings together technical experts, co-innovators, implementation specialists and progressive corporate collaborators that will allow us to inspire innovative knowledge sharing. Our co-create platform was made for innovators; it is the place where all of our community’s innovators come together for open innovations. • InnoTrek.ai: Personal digital travel guide using real-time GPS location and interactive voice Assistant. Brief about OI Lab founder? Sanjay Jangid, the Board Member of Open Innovations Lab with previous experience as a Software Engineer in a multinational company. Now advocating the open innovations at the corporate level and leading a team of professionals at OI Lab whose mission is to help identify and implement latest or trending tech products. Mentor of change for Atal Innovation Mission by Niti Ayog. Where is our startup based out of? Why do we think that is the best place for your business? Currently, we are operating in Rajasthan and have good traction on our OIL Platform. If we talk about technology innovations facility for nurturing this ecosystem which is limited to some high-end institutions or metro cities. There is a need for an open lab for validating the idea, build an MVP, test, research, and co-creation with co-innovators at tier-2 tier-3 cities. An Online or Virtual lab can solve this accessibility problem for all the initial level projects with exceptional ideas are promoted to the physical lab for further implementation. Finally, after quitting US H1B Visa from 4+ years corporate Job, I knew entrepreneurship can be a tough and long journey. Some get success first time only. For me, that wasn’t the case. We started OI Lab in March 2016. In starting I taught to create five-year business plans and outlines. How can we plan for five years when the landscape changes so rapidly, make plans but stick to the short-term and near future. If we talk about our startup challenges they are on every hook and corner of our journey and thus are true entrepreneurial life. Majorly our challenges are on team stack to get on board right team to execute the right plan, but I am fortunate gradually we accompanied by some rock star of our team. Who are our competitions and how are we better than them? The open innovation platform is one of the leading ways to spur faster and better creativity. It facilitates tech products implementation through an open flow of ideas, people and collaboration between the community and Government initiatives for fostering innovations. 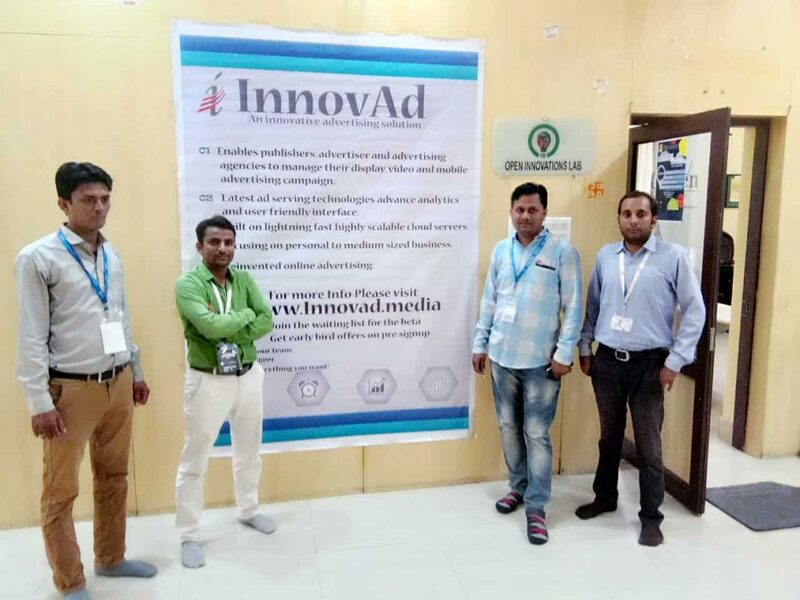 Our idea helped us in getting funded, incubated by the iStart which an initiative of Rajasthan government. Now we are in the middle of discussions for corporate collaborations to expand and scale our operations. We got collaboration opportunity from Innovationext and HDFC Bank-Fintech Partnership. Why would you want balance if you want to shake things up? If you are able to work for 8 to 9 hours a day and just relax for the rest of the day, well then, in all honesty, I don’t believe that you will be able to pull this off. If you really want to strive for success with your startup, you will probably spend your whole day with your business. Even though you are not “working”, you still feel you are working, I don’t think so. You need to be accessible wherever you are all the time. Quite honestly this never ever bothered me. I don’t think to be “on” 24×7, not affected my work/life balance. We conducted more than 50 open sessions on the latest technologies/product showcase/Design thinking workshops. The 500 plus techno giants/experts connected on OIL Platform. An ecosystem of 500 and more global innovators form fluid cross-functional teams to deliver integrated tech innovations. Now we are looking to onboard more numbers of students and innovators, for that we are conducting the workshops in colleges all around Rajasthan. Founder’s advice to budding entrepreneurs ? Starting your own business is like riding a roller coaster. There are highs and lows every turn you take is another twist. The lows and highs will come and, go but you have to be strong, keep your stomach tight and ride along with the roller coaster that you started. Honestly, I don’t work too much ‘The science behind this hack’ and is Greece has an average workweek of 42.2 hours for all types of employment and a productivity index of 76.3 (compared to 100 as an EU standard). On the other hand, the Netherlands has an average of 30.5 hours worked per week and a productivity index of 136.5. So work smart not hard. Hyderabad Based Startup Myclosetwear Helps In Mix-Match Your Clothes & Accessories. [Weekly Digest] Weekly Roundup about Latest Startup News.